What colour flashing lights does a pilot vehicle have? What colour flashing lights does a pilot vehicle have? The first pilot vehicle has yellow lights if it's a large load, or yellow and purple lights if it's a really large load (greater than 5m wide), and the second one has yellow lights with a sign that says wide load follows. Maintenance vehicles have flashing yellow lights, police vehicles have red and blue lights, and fire engines and ambulances have red lights. 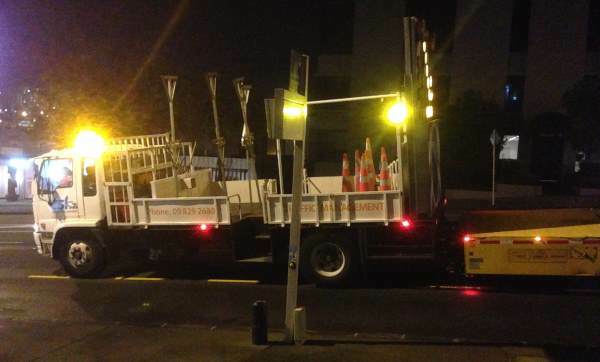 Maintenance vehicles use orange flashing lights usually on the vehicle's cab, but in the case of larger vehicles they are often on the rear, too. You can see in the video below that the vehicle behind the load (in this case, a house on the back of a truck), has flashing yellow lights. The pilot vehicle in front of the load will have yellow and purple lights if the load is greater than 5m wide, or yellow lights if it's between 2.5 to 5m wide. Police motorbikes, vans and cars (including unmarked cars) have red and blue lights. You can see both police motorbikes and police cars in the video below. Fire engines and ambulances have red flashing lights. Doctors on call can use a flashing green light, although they aren't allowed to break the speed limit like emergency vehicles are. Not many doctors use them, and there is low public awareness of them.